The R-PLEX Human PYY (total) includes a matched capture and detection antibody pair and calibrator for the quick and easy measurement of PYY (total) in biological samples. R-PLEX products leverage MSD’s electrochemiluminescence technology for better sensitivity and a larger dynamic range than traditional ELISAs. R-PLEX matched antibody sets enable the development of singleplex and multiplex immunoassays. Individual assays may be developed using MSD avidin- or streptavidin-coated plates. Custom multiplex assays with any combination of R-PLEX analytes, as well as R-PLEX plus U-PLEX analytes can be developed on U-PLEX MULTI-SPOT plates. To learn more about the advantages of R-PLEX products click here. Calibration curve for the R-PLEX Human PYY (total) was assessed and representative data is presented below. Description - Peptide YY (PYY, PYY-I, PYY1) is secreted from the intestinal L cells in proportion to the caloric content of a meal. Plasma PYY levels rise within 15 minutes after starting to eat and plateau within approximately 90 minutes. Two forms, PYY(1-36) and PYY(3-36) are released into circulation. PYY acts on neuropeptide Y (NPY) receptors in the CNS to mediate satiety. 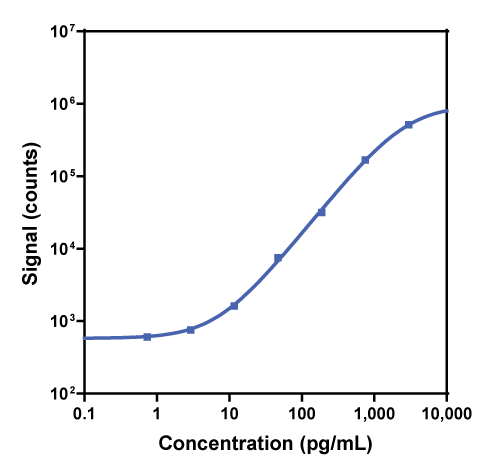 Administration of PYY(3-36) reduces energy intake and body weight in both humans and animals.This antibody set recognizes human PYY (total). Samples from other species were not tested.